Even though they are not regarded as true allergens, pollutants found indoors can cause allergic symptoms especially those that have pre existing allergies. In fact, their irritating action can both worsen and cause allergic reactions (asthma, rhinitis, conjunctivitis.). We spend more than 80% of our time, that is to say at least 20 hours per day for some people, in enclosed spaces. But inside these spaces, many pollutants develop, because of the excellent insulation and the confined spaces in which they settle. Some pollutants are found in concentrations 10 times higher than those found outdoors. 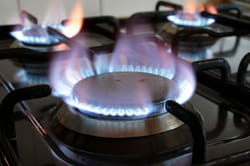 Gases emitted by gas stoves, pilot lights of boilers, gas radiators, fire-chimneys, radiators and tobacco smoke. They are found in kitchens, garages, dinning rooms and bedrooms. Nitrogen monoxide is a pollutant gas resulting from badly maintained heating and which causes each year 200 deaths. The low-dose chronic intoxication causes tiredness, dizziness, headaches to the elderly, children and those suffering from respiratory and cardiac problems. Check your equipment regularly and ventilate the kitchen properly. It comes from the combustion of coal and fuel. It is found in bedrooms equipped with coal and fuel oil heating systems. Volatile organic compounds are chemical substances which volatilise at room temperature. These products can survive for years in dwellings. Degradation of materials can worsen the symptoms caused by these substances. Ventilate regularly at least for 30 minutes in all seasons throughout the year, in winter as well as in summer. Sweep chimneys once a year. Check humidity levels: humidity: a high moisture content worsens the concentration of pollutants; the degree of humidity should not exceed 40 to 45% approximately. Latest update on December 20, 2010 at 05:09 AM by Janey39. This document, titled "Indoor pollution," is available under the Creative Commons license. Any copy, reuse, or modification of the content should be sufficiently credited to CCM Health (health.ccm.net).